Plug and Plant Vertical Garden kits is the most perfect gardening ideas for decorating your boring indoor and outdoor walls with colorful plants, flowers, herbs, etc. There are different type of vertical gardening namely living wall planters, Green wall, tiered garden, stackable and much more, in the queue falls the Plug and Plant Vertical Gardening Systems. As a journalist, I have researched a lot about these vertical gardening, my favorite one among the various type is plug and plant as it involves a modular wall mounted tillage system along with a watering tank, a smartphone app and few smart sensors for making your gardening work much easier. But unfortunately, this plug and plant vertical garden kit were canceled by the manufacturer Vertical Green. 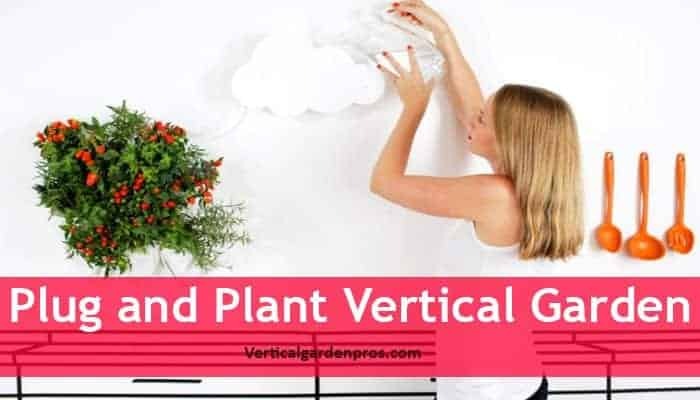 Here in this article, i have shared about the features and specifications of plug and plant vertical gardening systems, the reason for the cancellation and other few alternative vertical gardening to choose over the systems. Plug and Plant Vertical Gardening kit, incorporated by the Mexican Company Vertical Garden, made of interlocking “plugs” plant and can be mounted on a wall. Vertical Garden is a part of verde vertical who is specialized in developing vertical gardens for their customers. This includes the creation of the garden on the walls and the sides of the wall using the water distribution and bio foam. Each plug indulged has a prepackaged seed, the smart sensor(measures light, humidity, temperature and other environmental conditions) and a smartphone app( the data generated is available on your smartphone via the Bluetooth). Therefore you stay updated about your vertical gardening kit. You will be able to connect multiple plugs as per your need based on the types of herbs, fruits, flowers and vegetables you choose. Adapting this vertical gardening system at your indoor and outdoor space act as a decorative element, used for medicinal and culinary activities too. There are multiple reasons why I like this vertical gardening system like they are smart, helps in increasing productivity, purify air, reduces the stress level, affordable, excellent, innovative design, creativity and much more. Here are few specifications that made many customers and myself to prefer them to the core. Watering Tank(Automated): The plug and plant vertical gardening kit include a water tank that helps in developing your plants, and this can hold the water for the plants up to 30 days, after that you will be indicated with a message on your smartphone. Interlocking Quality: The modular system enables you to connect the plug vertically, horizontally and diagonally easily. Smartphone App: Help to know the status of your seeded plants and you can even share it on the social media so that the plug and planters in the social profile gets connected, establish a relationship and can share any info related to your plants uniquely. Simple Installation: You need a vertical surface along with lighting to fix these plug and plant vertical gardening system and can be installed within 10 minutes without much effort. Innovative: No other vertical garden system is involved with a smartphone app or smart sensors to know the status of your plants and measures the environment changes. The manufacturer’s innovative is seen clearly in the design. Natural Aesthetic: The vertical gardening system enables you to easily indulge with any diverse spaces effectively with the help of natural and clean aesthetics. Biodegradable Smart Bio Foam: The vertical gardening system is sustainable and clean and helps your plant roots to develop as they grow in soil. Hydroponic Technology: The vertical gardening system involves the hydroponic technology and therefore helps your seed to grow faster and without any restrictions. Unlimited growth is guaranteed with this plug and plant vertical gardening system. Disposable Plugs: You can connect any number of plugs to grow your favorite plants, veggies, fruits, flowers, herbs, etc. Each plug will contain high premium quality seeds for the efficient and optimal growth. Growing of plants is assured until the plant’s roots are connected to the panel. Versatile: You can choose the plugs as per the space of your indoor or outdoor area. The smart vertical garden allows you to develop small or larger garden as per your requirement. Why Vertical Garden Cancelled the Plug and Plant Vertical System? The real reason for the question is still pending, but according to my research, most of the trusted publications says the manufacturer had a problem with the initial fundraising, and they were low for creating the plug and plant vertical gardening system. The manufacturer was not entered in developing new venture and were not able to meet the expectations for it. Whatever the reasons, we have missed this plug and plant vertical gardening system for our garden, indoor or outdoor space. Apart from the Plug and plant vertical gardening system, many vertical gardening products are superior, affordable, practical and adorable. Here are few of the vertical garden and high tech garden that you can adapt to your indoor or outdoor areas. The manufacturer developed this product to be a perfect addition to any indoor, or outdoor area that does not require much sunlight for the plants to grow, the price of the product is high but worth the money spent. Available in multiple colors, ideal for kitchen, balcony, desk, etc. You can choose any plants, herbs, flowers to grow in this vertical gardening. The product comes with a pot that uses hydroponics and a LED light to grow the plants in any environment conditions. The LED light provides 16 hours of light to the plants for the rapid growth; the system lets you know when the plants are in need water. This product is one of the advanced hydroponic system and similar to the click and grow; they also have the capability to grow in any environmental conditions. This system is costly and available in different colors, models and comes with three to six pot per system. The self-contained system lets you know when the plants are in need of nutrients and water. The Built-in LED light system helps your plants to grow faster and efficiently, the result you achieve is the nutritious veggies, fruits and flowers, this growth is five times faster when compared to the plants that grow in soil. Apart from these high tech vertical gardening systems, there is also other low-tech vertical gardening systems like 8 Pocket gardening system from invigorated Living, Florafelt Vertical gardening kit, Gronomics Vertical Gardening Kit, Algreen vertical gardening system and much more. You can opt to the one that is suitable for your gardening requirements. Plug and plant vertical gardening system are one of the fresh, smart, innovative and stress-free gardening systems till now. Though we missed now, let’s expect this vertical gardening system from the same manufacturer or different manufacturer in future. Any ideas, thoughts, and queries on the topic are welcome, feel free to contact us anytime through the comment section below.